Previously released exclusively on Steve’s mail-order only Timeroom label, this soundtrack release is now available to retail on Projekt. Elegantly repackaged for its 10th anniversary, the Day Out of Time is available as a digi-pak edition. The power of the desert has been a core inspiration of Roach’s work and this release presents a compendium of tracks recorded at the zenith of that period. As a comprehensive overview of Steve’s influential tribal-ambient and desert-ambient soundworlds, Day Out of Time weaves together classic tracks along with out-of-print and hard-to-find pieces. Sustained and expansive, the atmospheric majesty of this soundtrack represents some of Steve’s finest work in the tribal-ambient genre. In the midst of a deeply stratified soundscapes, dynamic earthbound tribal percussion passages rise up from the landscape under the shadows of billowing, glass-bottomed clouds. Part tribal, part haunting drifts, and purely time suspending, the release is essential Steve Roach. Like the stone monuments and forever vistas that inspired the music, this release majestically stands up to the test of time. It sounds as if it emanates from deep desert canyons in a realm from the near future or ancient past. Never before available in stores, the Day Out of Time audio CD paints visceral soundworlds from vast desert vistas, jagged peaks, and iconic stone pinnacles carved by wind, sand, and water into fantastic alien sculptures. The music tells the wordless story of the desert dreamtime. For electronic music aficionados, established as well as new Steve Roach fans, Day Out of Time – is a vital and rewarding listening experience. Projekt Records has re-released a pair of early Steve Roach works, Day Out of Time and Stormwarning. Covering two very distinct periods of Roach’s style, the first makes for a superb reconsideration of his desert ambient work, while the second dives back into the Klaus Schulze-inspired, rapid-fire analog energy that marked his earliest albums. 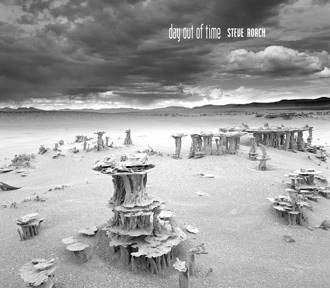 Day Out of Time was created as a soundtrack for the Steve Lazur film “Time of the Earth.” The pieces picked to accompany Lazur’s mosaic of time-lapse images of the stark and startling beauty of the American desert were taken from various existing releases, along with some new (at the time of the original release) material. It all comes together in a classic Roach desert/tribal meld, full of shadowy whispers, desert-night field recordings, snarling didge and spirit-grabbing percussion. The disc certainly adds a dimension to Lazur’s film–not being a film critic, I’ll withhold comment–but is also a great listen on its own. While the tracks contain a lot of common threads that run through thjs chapter of Roach’s style book, it’s a well-modulated collection. When the feel is out in the open, as in “This Life” and the fantastic, drum-driven and drone-underscored “True West,” it’s vast and spacious. When it goes underground, as with “Walking Upright,” one of my personal favorite tracks from Early Man, it’s pleasantly dark and mysterious, the atmospheres absolutely dripping with detail. For anyone not familiar with this arc of Roach’s career, Day Out of Time is an excellent primer. For existing fans, it’s a new way to revisit these superbly carved landscapes. Stormwarning captures three early live performances, from 1985, 1987, and 1991. Culling structures from three of his earliest albums, Traveler, Now, and Empetus, in these concerts Roach essentially built a full studio set-up on stage and took off on deep sequencer excursions. The three tracks are live and straight to tape, with no overdubs, no backing tapes, and no post-production remixing. This is Roach on the fly and very much hands-on with his analog-only gear, manipulating the flight and flow as he goes. “Day One” opens with a quiet set of ambient chords reminiscent of (though pre-dating) sounds on Dreamtime Return. Out of nowhere, sharp clarion-call notes mark a shift, and the sequencers kick in. The dense weave of notes–on all three tracks–is astounding not just in its complexity, but also in how Roach drops out and picks up different sets to alter the complexion of the thing across a track. “Day Two” shares a similar structure with the first track, but here the opening feeling is grimmer and more shadow-choked. Rippling bass notes threaten over distant clattering sounds and a rising electronic wind. The sequencer lifts off from the midst of the mix, a potent dose of light and energy pulling away from that darkness. Roach fires off a Berlin School-style melody over the sequencer bounce. There’s a great spot where Roach is absolutely thrusters-at-full, exploding across the space at near-light speed, then slams on the brakes and shifts the tempo down innumerable notches without missing a step. Here comes the hyperbole: it’s literally breathtaking. “Day Three” is from a concert in Germany six years after “Day One.” A misty wash solidifies slowly into the sequencer pulse here, and again there are very distinct echoes of Dreamtime, which had by then been released. While the sequencer holds the low rhythmic end, we get the twanging notes and subtle percussion of that landmark disc, covered in flowing ambient pads.The percussion gets heavier and more tribal as the track goes on. “Day Three” seems somehow more full of life than its counterparts, or simply bigger. It’s less given over to the high-speed demonstrations than to spreading out the sounds and exploring the difference between pulse and flow. It may also be that the Roach here is on the cusp of shifting styles, the precursor to the Roach we hear on the Journey of One CD. Thinking along those lines, “Day Three” is a nexus of styles, and a perfect way to showcase the artist’s progression while also showing the through-line back to his beginnings. Stormwarning is an absolute overdose for analog lovers, a synapse-blistering ride that requires that you play it loud.